Twitter has more than 9100 tweets per second summing up to over 1 billion tweets in just five days. Around 40% of twitter’s followers (of around 645.7 million of twitter’s active users) are just spectators meaning, they just see others tweeting without themselves tweeting anything. Now that you know how huge twitter is, I don’t see any chance of ignoring this huge marketing ground. If you are worried on how to increase your twitter followers, just thank God you found this post. This is the unofficial twitter guide to get more followers. Let me guess your story and probably mine too. You just opened up a twitter account, most probably out of curiosity or when making social accounts for your website. In the first month, you got over 30-40 followers by inviting friends and adding contact list from your phonebook to your account. You also happened to manage more 15 followers by aggressively promoting your twitter account across Facebook, Google plus and follow me I will follow back schemes (It’s no bad but pains, even I did it at some stupid point of my life). But now what? How to get it over 100 or perhaps the next 1000 followers? This was the time when I thought seriously about twitter strategies and came up with a through plan of getting more twitter followers with easy and respectable ways. I am going to show you the complete twitter marketing strategy to gain followers and increase your twitter reach. Let’s start from the basics because this is the part we often overlook. For getting perfect number of followers you need a perfect professional twitter account that will attract followers to check in. Follow these tips to make your twitter account as attractive as those with millions of followers. If you already have a twitter account then, reconsider a professional twitter handle. No one likes to follow a handle that is irrelevant. 1 - Try using smaller handles (twitter won’t allow you to go beyond 15 letters). 2 - Do not use religious or emotion provoking handles unless you specifically are into that business. 3 - If your handle is not available use words with numbers. Like if @JhonDoe is not available you can go for @JhonDoe42 or be creative like @Jh0nDoe, yes that’s a “zero” in place of the first “O”. 1 - Use an avatar that represents who you truly are. While this has been said many times earlier, we often forget that twitter, like other social platforms, is a place for human interactions. So better use a picture that has your headshot or the logo of your business in case you want to build a brand around that. Avoid using cats, dogs or even celebrity avatars as your professional twitter profile picture. 2 - Twitter now uses a cover photo similar to Facebook’s layout. You have got so much estate to show your professional value. Use it to promote your products or the company theme you want to be known of. 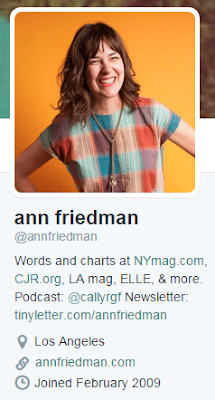 Twitter provides you with twitter bio which shows up right below your avatar whenever anyone visits your profile. Be creative to use this 140 character space to attract more leads and twitter followers. 1 - Write your passion, your strength and your achievements in it. 2 - Be funny and show the creative side of you in the twitter bio. 3 - Whenever people use the twitter search for searching someone the results usually show up using the data given in the profile bio. This shows your bio acts as a bundle of keywords. Resource: Check this post by Ashley Faulkes to know more about perfect twitter bios. TIP: Use hashtags before words that you want to appear for when people search for you. For example, use #blogger. TIP: Use links in twitter bio. You are allowed to use one standard link after your bio but you can use the links to your email newsletter. Here is a screenshot of awesome twitter bios that can inspire your creativity. Twitter is all about finding the right people and the right niche to be seen on. You cannot just go and have a bundle of friends and family on twitter in order to get some following. You need to add your prospects, your future clients and the other influencers in your niche. If you are worried how to find the best loyal followers, then read on. If you want to get in the eyes of your potential audience then you have to first go and follow the influencers in your niche. It is from their twitter activities that you will find like-minded twitter users. 1 - Try to give relevant replies for the tweets these influencers tweet. A just “nice post”, “Thank you” wouldn’t do enough to attract them. 2 - Don’t be scared to reply a link of your post if you think it’s worthy. The influencers have many followers who see their tweets and also the replies to others. It is from here that you will start getting noticed. Though Twitter’s own advanced search does pretty well in searching the appropriate twitter followers based on age, demographics and other data like keywords in twitter bio and tweets, it is always beneficial to use a tool that is specifically built for it. I really like how you can search millions of twitter followers through TweetAdder and filter them as per your needs. The below screenshot show how to filter twitter users based on follower count, keywords in bio, popular or new users and through keywords in tweets. One more advantage is you can mass follow, unfollow everyone through the displayed results with a single click. I typically follow other based on my niche and those with active twitter timeline. In order to get in front of a vast audience, you must know the art of following. Twitter allows you to follow 2000 people more than your current following count. Now if your follower count is 5000 you can follow 7000 people at the maximum. Never mind we have a work throughout for it too, which I will be discussing later. 1 - Everyday, using twitter’s advanced search, or tools like tweetadder search for people similar to your niche. Like if you have a “basketball” related blog, search for basketball or sports as a keyword. 2 - Without thinking a second, follow the relevant twitter profiles may be 500 per day. TIP: Don’t follow people with “eggs”, I mean people with default twitter avatar as their profile picture. These are the people with spam accounts or newbies that wouldn’t add any value to your community. 3 - If you follow 500 people a day, chances are 140-150 will follow you back as a sign of courtesy or because they want to network with you (Which is what we want!). TIP: In order to do it quick enough I have developed hack. I go to influencers in my niche, (Like @MariSmith if I want to get followers interested in social media or @Adobe if I am having a blog on PDFs or products of Adobe), go to their follower list and deliberately add up to 100-150 at a time. This hack is named as “Follower hijack” by me because it essentially does that, hijacking followers from the influencer accounts. If you provide valuable content these followers will follow you back and will be yours forever. As I have told you before, you can only follow 2000 more people than your current follower count, how to get this into your benefit? Use a tool like followers.me or socialbro to unfollow the non-followers or the ones that have unfollowed you. These tools are all free and pretty handy in checking the following to follower ratio. By regularly unfollowing the non-followers or the ones that do not show any activity on your profile, you will not only keep it clutter free but also attract new twitter followers to follow you. Twitter users are always in the lookout to get new information, valuable resources and motivational tweets. You can utilize this strategy to create and curate posts/tweets that will be valuable for your twitter followers. By curating I mean, you don’t have to create all the stuff your followers will like. Simply find resources or tweets from other people and tweet them in a new convincing style, with proper owner attributes. You can also create a list of twitter accounts of industries in your niche and then tweet important happenings as they happen. Use images as a must. Images can be motivational, funny or statistical, have a proper blend of all. While writing blog posts make sure you use elements that makes the readers tweet your blog post right away. You can use the free tools like SumoMe or ClickToTweet to introduce tweetable bits, quotes, and facts in your blog post. Variety will make your blog post enjoyable while these tiny snippets will make it tweetable too. Many times what we do is have a simple “tweet” button and think it is enough. But we also think that many twitter readers have their own comfortable time of tweeting. Some might not want to tweet your stuff at a time when their followers are used to read their own tweets. In this case, a scheduling button like Buffer or HootSuite gives your readers the flexibility to share your posts at a time they think fit. In order to get popular you have to break the ice and mingle with others. Never forget a social media platform is called social because it is meant for interactions. You will be surprised how interactions can help you gain more twitter followers. 1 - Reach out to influencers: Don’t just quote them, retweet them. Mention influencers in your blog post and share the link mentioning their username in twitter. Most as a sign of gratitude will retweet or buffer it to send it to their followers. This not only means you caught the noise of the influencer but also means your tweet (and you) are exposed to their massive following. Many of their followers will follow you. 2 - Thank the new followers: Please and thank you are two golden words. Did I remind you of primary moral science classes? Yes, we haven’t forgotten it, have we? It is often noticed that greeting a new follower through a welcome message increases chances of interaction between the two of you. In case you have a landing page, put the URL in the tweet and ask the follower to get his free gift, give his opinion on or just visit the URL. This is a good trick to convert your twitter follower into your reader. TIP: With free tools like unfollowers.com you can set a direct automated tweet for new followers. MY ADVICE: Personally I would advise you not to follow these tools and instead carve a fresh tweet to your new followers, because no ones like being greeted by an automated message. It does more good than bad. Twitter has a very handy and unique feature of using the twitter lists. Twitter lists are groups of specifically added tweets (twitter users) by you. You can categorize your followers and others into categories that would make it easy to interact with them. Here is a detailed guide on using twitter lists effectively. TIP: worried about promoted tweets and Put all those who you want to hear from in separate lists. Like news channels in a list called currentnews, family in a list called family tweeps etc. This will help you to remove the noise off your twitter feeds and you can concentrate on your followers. In order to get more followers you have to analyze your ongoing twitter activities. You need to know when you get responses from your audience, when your target audience is online and the time when your tweet is seen by maximum people. 1 - Use twitter analytics for knowing which type of content receives major interaction by your followers. This will help you to carve more such content so that you need to have in order to attract new followers. 2 - Know the time at which you receive maximum retweets so that you can concentrate at that time. At least, try tweeting five times a day on twitter. This will help you reach the audience that aren’t in your follower list too. Resource: Here is an awesome guide on twitter analytics. TIP: As you know it’s impossible to cater to the audience that is at a different time zone than yours. Instead of waking up at late night to tweet an update try using popular scheduling tools like Hootsuite. Hootsuite supports auto-schedule to tweet your updates at a time that is best suited to grow your follower count (that is based on a number of factors). I have been using it for years now and simply can’t live without it. If you want to be followed, go first monitor your would-be followers. You can do it by using a list to add all your followers into it. Then you can monitor what they are tweeting. It is like following them, but without actually doing it. Now, tweet similar tweets or updates and make them your followers forever. No one would ever like to follow someone who has nothing to provide them with. Have you noticed the influencer bloggers selflessly promote other people’s tweets, valuable video links, news etc.? It is not because they are not having enough tweets of their own; it is a strategy to captivate their followers by providing them with all they need so that they don’t go anywhere else. You can also use such a strategy. In fact, it will lessen your hard work. TIP: In order to share docs and other PDF files on twitter use Twitdoc. Did you know how bloggers like John Morrow had thousands of followers even before they had a blog? It’s simple; they flaunted their twitter handle at every possible place people could see. John Morrow used his twitter handle in the author BIO for the numerous guest posts he wrote. Thereby making the reads aware that in order to connect with John they should follow him. You too can follow the strategy but make sure you don’t add too many social profiles or your followers will be divided. Alternatively, you should have a large, easily visible twitter handle on your website. You also can use it as your email signature, signature at the bottom of your SlideShare presentation, anywhere, just be creative and sky is the limit. Hashtags are like keywords, people search for hashtags to get tweets of a similar genre. You can use hashtags to increase the shelf life if your tweets. Hashtags allow your tweets to reach an audience beyond your followers. Common hashtags for bloggers include #Bloggerswanted #blogher15 #bloggingtips. Occasional ones might change throughout the days according to trending events. For weekends and week days hashtags like #TBT, #TGIF, #mondayblogs are quite popular. Participating in twitter chats will help you get more twitter followers and also grab eyeballs that otherwise wouldn’t be possible. In case you don’t know, Twitter chats are special live discussions on twitter using a particular hashtag like #bufferchat hosted by buffer, #USGuys that has many US guys waiting to connect, etc. By participating in these chats, you get to show your skills to an audience untapped and also connect with them and make friends and followers. Monotonous tweets may sometimes not attract new followers. Try using twitter to funnel out followers as an exchange for a bonus. Who doesn’t like bonuses? I would say instead of using all you’re following in one single giveaway, try making the giveaway and free gifts from your blog to promote channel specific events. For example, conduct giveaways for twitter followers exclusively. I know people might unfollow you just after the giveaway is done. The trick is conduct regular giveaways that will have twitter followers only as eligible for winning. You can have similar ones for Facebook also. This will prevent the followers to unfollow you and rather add new followers who will also turn into your permanent followers. If I said you have to get or target all twitter users only then I would be completely wrong. In today’s world, you never know where your target follower resides. Maybe you will find him on Instagram, maybe he is a bit active on Facebook. So, try cross posting your updates, like tweets to Facebook profile, tweets to LinkedIn etc in order to attract your followers there and notify them that you have a twitter profile too. This will act like teaser and you never know who on LinkedIn will notice your tweet and love it and start following you on twitter. Research shows using call to action like visit link, please retweet and other such CTAs help to get more interaction than plain barren tweets. It’s easy and fast. A simple call to action will help your audience get engage more with your tweets. Using proper strategies and simple interacting with your would-be audience you can get more twitter followers. Getting more twitter followers was never a rocket science. Nor these influencers used some magic to get huge number of followers. In fact, they used the same strategies discussed above to gain a boost in twitter followers. Using some pre-tested formulas like CTAs or twitter hashtags you can engage your twitter audience to the next level. Tools like tweetadder and hootsuite actually make this process a fun ride. Using various tools you can actually amplify your efforts and make more twitter followers in relatively less time. What are your secrets to getting more followers on twitter? I am sure there are different ways for different people. Ankit Singla - Author - Thanks for this great article!